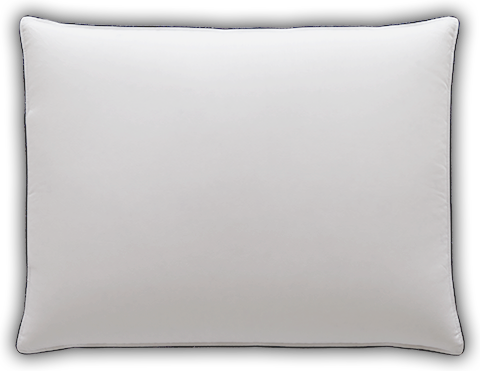 Snuggle in for a great night’s sleep with our medium support Classic pillow featuring fluffy premium down covered in cotton sateen giving you inviting softness inside and out. I sleep with the king- size medium down pillow and I love my pillow! The pillow is squishy and moldable yet still provides head and neck support. I sleep in all positions and the pillow adapts to me as I sleep. The pillow does not lose any down and it is very well constructed, top quality. Pacific Coast® Classic medium support pillow adjusts with you as you change positions throughout the night. The sink in loft comes courtesy of the 550 fill power of Hyperclean® down that is fluffy and inviting. The cover is an incredible 500 thread count, 100% cotton sateen delivering silky softness that will wear beautifully over time. We’ve finished this traditional medium support pillow with navy blue printed cording giving it a chic look, and the entire pillow can be machine washed and dried for easy care.